If you’re thinking of heading to the Caribbean for a romantic, week-long winter getaway, here’s an idea: Instead of spending all seven nights on one island, why not split your time between two? Island hopping is easier in some destinations than others, so here’s a roundup of five two-island options that are not only easy to combine logistically, but also feature varied landscapes and ambience. Note: Caribbean resorts do command premium rates until mid-April or so, but if you check deal-finder sites, including ShermansTravel.com's nifty price-comparison tool, you may be able to score some last-minute price breaks. Or, if you want to see multiple islands, you can always take a cruise. Check back next week for details on my favorite ships and itineraries. St. Maarten/St. Martin & Anguilla: Flying into St. Maarten/St. Martin, with its large cruise port and world-famous runway over Maho Beach, you’ll quickly realize that this dual-personality island bustles with two distinct vibes (quainter and French on the St. Martin side and casino-centric and Dutch on the St. Maarten side). This makes it not only unique, but also a great partner island for its smaller and more tranquil neighbor, Anguilla. Book a round-trip flight to St. Martin/St. Maarten, where your resort choices include romantic, bougainvillea-draped La Samanna (from $945/night) and the more contemporary Westin St. Maarten Dawn Beach Resort & Spa (from $322/night). Then simply hop a 25-minute ferry from Marigot to Blowing Point on Anguilla, where the laid-back vibe is perfect for winding down. Resort choices include luxurious and contemporary Viceroy Anguilla (from $950/night), romantic and Moorish-inspired Cap Juluca (from $1,275/night), beach-and spa-centric CuisinArt Golf Resort & Spa (shown above, from $560/night), and affordable-chic Ku (from $315/night). Barbados & St. Lucia: Flat and sugarcane-covered and mountainous and rain forest-dotted – two islands could not be more different. Yet, with only about 100 miles between them, British-influenced Barbados and Creole-flavored St. Lucia make them a great vacation duo. Fly into Barbados and connect (via a 45-minute flight on LIAT) to St. Lucia. Your resort choices here are exceptional, ranging from the charming and affordable Ti Kaye Village (shown at right, from $325/night) to the over-the-top and dramatic Jade Mountain (from $1,200/night). In between, you’ll find all-inclusive ease at lively Sandals Grande St. Lucian Resort & Spa (from $683/night, all-inclusive) or spa-focused and newly renovated The BodyHoliday Le Sport (from $872/night, all-inclusive), as well as contemporary ambience at Cap Maison (from $435/night) and romantic allure at The Jalousie Plantation Sugar Beach (from $550/night). 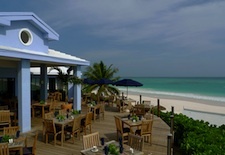 Head back to Barbados and enjoy the colonial elegance of Coral Reef Club (from $805/night), the newly polished luxury of The Fairmont Royal Pavilion (from $825/night), the renovated sleekness of Tamarind (from $630/night), the affordable comforts of the Hilton Barbados (from $299/night), or the restful seclusion of The Atlantis Hotel (from $255/night). Puerto Rico & Virgin Gorda (or Vieques): The colonial vibrancy of Old San Juan and the lively beach resorts and casinos of Condado and Isla Verde, make Puerto Rico a perfect partner to blissful Virgin Gorda, located a 40-minute flight away in the British Virgin Islands, or low-key Vieques, located just off of Puerto Rico’s east coast. In Puerto Rico, stay on the beach in Condado at the appealing San Juan Marriott Resort & Stellaris Casino (from $269/night), the retro-modern La Concha, A Renaissance Resort (shown at left, from $259/night), or in Isla Verde at luxurious The Ritz-Carlton Resort, San Juan (from $359/night). If you’ll be traveling without passports, take a quick flight to neighboring Vieques, where unspoiled beaches and a rare bioluminescent lagoon offer up natural splendor just a short drive from the trendy W Retreat & Spa – Vieques Island (from $415/night). To go international, fly to Beef Island/Tortola in the BVIs and hop the ferry to beach-fringed Virgin Gorda, where its boulder-strewn Baths landmark is extraordinary and resort choices include classic luxury at Rosewood Little Dix Bay (from $795/night) and laid-back tranquility at Biras Creek (from $655/night). St. Kitts & Nevis: You have to fly to St. Kitts to get to Nevis, so why not check out what this big-sister/little-sister island combo offers in tandem? Start on St. Kitts, known for its monkey- and zip line-filled tropical landscape. 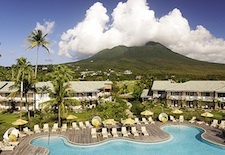 Stay at the sprawling and wallet-friendly St. Kitts Marriott Resort and Royal Beach Casino (from $259/night). 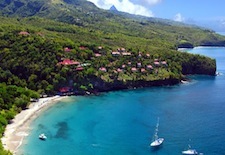 Then ferry over to historic, 36-square-mile, cloud-topped Nevis (home to monkeys, as well as romantic plantation estates) and check into the newly renovated and luxurious Four Seasons Resort Nevis (shown at right, from $695/night) or the secluded and romantic Montpelier Plantation Inn Nevis (from $545/night). Nassau & Eleuthera: The capital of the Bahamas has its colonial charms and quite a few splendid beaches, but they are regularly overrun by the hordes of cruise ship passengers who drop in daily. So after you enjoy a few days of duty-free shopping on Bay Street and gambling in the casino at Atlantis on Paradise Island, you can wing it over to sleepy Eleuthera or chic Harbour Island and chill “Out Island” style. 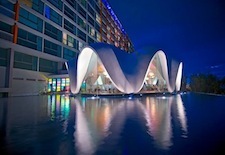 On Nassau, stay at the contemporary and trendy The Cove Atlantis (from $769/night), the historic British Colonial Hilton (from $209/night), funky and colorful Compass Point (from $220/night), or beachfront Sheraton Nassau Beach Resort (from $269/night). A 30-minute Bahamas Air flight to Rock Sound lands you on Eleuthera, where you can easily find a deserted beach to call your own while staying at peaceful The Cove Eleuthera (from $245/night), or head over (by ferry) to chic, pink-sand Harbour Island, where resort options include pastel-hued Pink Sands (shown at left, from $600/night) and boutique The Rock House (from $300/night). See our St. Martin Travel Guide, Anguilla Travel Guide, Barbados Travel Guide, St. Lucia Travel Guide, Puerto Rico Travel Guide, British Virgin Islands Travel Guide, St. Kitts Travel Guide, Nevis Travel Guide, Nassau/Paradise Island Travel Guide, and Bahamas Travel Guide for more trip-planning information, then use our Travel Search price comparison tool to find the lowest rate on flights, hotels, packages, and more travel deals.